is a workable paste used to bind building blocks such as stones, bricks, and concrete masonry units together, fill and seal the irregular gaps between them, and sometimes add decorative colors or patterns in masonry walls. In its broadest sense mortar includes pitch, asphalt, and soft mud or clay, such as used between mud bricks. Mortar comes from Latin mortarium meaning crushed. Cement mortar becomes hard when it cures, resulting in a rigid aggregate structure; however the mortar is intended to be weaker than the building blocks and the sacrificial element in the masonry, because the mortar is easier and less expensive to repair than the building blocks. Mortars are typically made from a mixture of sand, a binder, and water. The most common binder since the early 20th century is Portland cement but the ancient binder lime mortar is still used in some new construction. Lime and gypsum in the form of plaster of Paris are used particularly in the repair and repointing of buildings and structures because it is important the repair materials are similar to the original materials: The type and ratio of the repair mortar is determined by a mortar analysis. 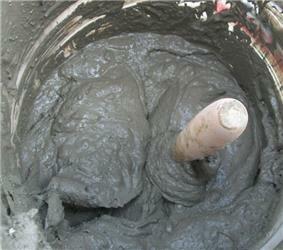 There are several types of cement mortars and additives. The first mortars were made of mud and clay. Because of a lack of stone and an abundance of clay, Babylonian constructions were of baked brick, using lime or pitch for mortar. According to Roman Ghirshman, the first evidence of humans using a form of mortar was at the Mehrgarh of Baluchistan in Pakistan, built of sun-dried bricks in 6500 BCE. The ancient cites of Harappan civilization of third millennium BCE are built with kiln-fired bricks and a gypsum mortar. Gypsum mortar, also called plaster of Paris, was used in the construction of the Egyptian pyramids and many other ancient structures. It is made from gypsum which requires a lower firing temperature so is easier to make than lime mortar and sets up much faster which may be a reason it was used as the typical mortar in ancient, brick arch and vault construction. Gypsum mortar is not as durable as other mortars in damp conditions. In early Egyptian pyramids constructed about 2600–2500 BCE, the limestone blocks were bound by mortar of mud and clay, or clay and sand. In later Egyptian pyramids, the mortar was made of either gypsum or lime. Gypsum mortar was essentially a mixture of plaster and sand and was quite soft. In the Indian subcontinent, multiple cement types have been observed in the sites of the Indus Valley Civilization, such as the Mohenjo-daro city-settlement that dates to earlier than 2600 BCE. Gypsum cement that was "light grey and contained sand, clay, traces of calcium carbonate, and a high percentage of lime" was used in the construction of wells, drains and on the exteriors of "important looking buildings." Bitumen mortar was also used at a lower-frequency, including in the Great Bath at Mohenjo-daro. Historically, building with concrete and mortar next appeared in Greece. The excavation of the underground aqueduct of Megara revealed that a reservoir was coated with a pozzolanic mortar 12 mm thick. This aqueduct dates back to c. 500 BCE. Pozzolanic mortar is a lime based mortar, but is made with an additive of volcanic ash that allows it to be hardened underwater; thus it is known as hydraulic cement. The Greeks obtained the volcanic ash from the Greek islands Thira and Nisiros, or from the then Greek colony of Dicaearchia (Pozzuoli) near Naples, Italy. The Romans later improved the use and methods of making what became known as pozzolanic mortar and cement. Even later, the Romans used a mortar without pozzolana using crushed terra cotta, introducing aluminum oxide and silicon dioxide into the mix. This mortar was not as strong as pozzolanic mortar, but, because it was denser, it better resisted penetration by water. ^ "Ancient Bricks". Aurangzeb Khan. Retrieved 2013-02-16. ^ "Egypt: Egypt's Ancient, Small, Southern, Step Pyramids". Touregypt.net. 2011-06-21. Retrieved 2012-11-03. ^ a b "HCIA - 2004". Hcia.gr. Retrieved 2012-11-03. ^ "American Scientist Online". Americanscientist.org. Retrieved 2012-11-03. ^ "Revealing the Ancient Chinese Secret of Sticky Rice Mortar". ^ Masonry: the best of Fine homebuilding.. Newtown, CT: Taunton Press, 1997. Print. 113. ^ "ASTM C 270-51T". ASTM International. Retrieved 10 September 2015. ^ "pozzolana." Collins English Dictionary - Complete & Unabridged 10th Edition. HarperCollins Publishers. 14 May. 2014. An international team headed by Åbo Akademi University has developed a method of determining the age of mortar using radiocarbon dating. As the mortar hardens, the current atmosphere is encased in the mortar and thus provides a sample for analysis. One major challenge is various factors that affect the sample and raise the margin of error for the analysis. 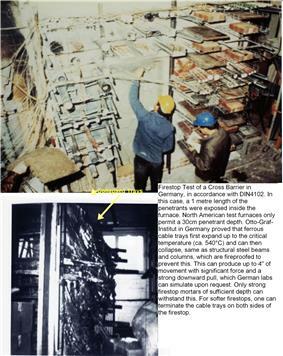 Firestopped cable tray penetration. 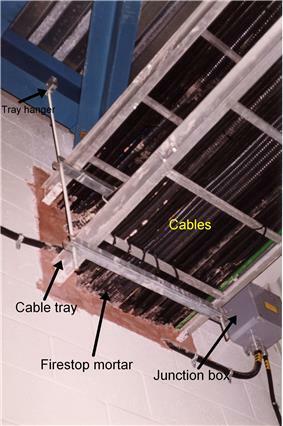 The cables and the tray are penetrants. Firestop mortar is usually a combination of powder mixed with water, forming a cementatious stone which dries hard. It is sometimes mixed with lightweight aggregates, such as perlite or vermiculite. It is sometimes pigmented to distinguish it from generic materials in an effort to prevent unlawful substitution and to enable verification of the certification listing. Firestop mortars are mortars most typically used to firestop large openings in walls and floors required to have a fire-resistance rating. They are passive fire protection items. 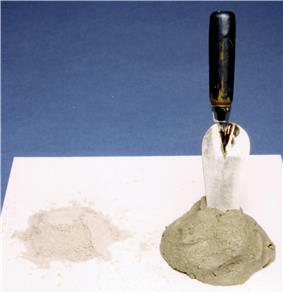 Firestop mortars differ in formula and properties from most other cementitious substances and cannot be substituted with generic mortars without violating the listing and approval use and compliance. Finely ground and mixed with lime it is a hydraulic cement, like Portland cement, and makes a strong mortar that will also set under water. Pozzolana is a fine, sandy volcanic ash. It was originally discovered and dug at Pozzuoli, nearby Mount Vesuvius in Italy, and was subsequently mined at other sites, too. The Romans learned that pozzolana added to lime mortar allowed the lime to set relatively quickly and even under water. Vitruvius, the Roman architect, spoke of four types of pozzolana. It is found in all the volcanic areas of Italy in various colours: black, white, grey and red. Pozzolana has since become a generic term for any siliceous and/or aluminous additive to slaked lime to create hydraulic cement. Lime mortar is considered breathable in that it will allow moisture to freely move through and evaporate from the surface. 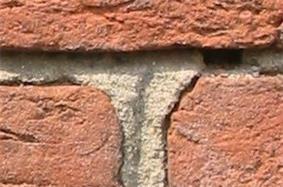 In old buildings with walls that shift over time, cracks can be found which allow rain water into the structure. The lime mortar allows this moisture to escape through evaporation and keeps the wall dry. Re−pointing or rendering an old wall with cement mortar stops the evaporation and can cause problems associated with moisture behind the cement. It would be problematic to use Portland cement mortars to repair older buildings originally constructed using lime mortar. Lime mortar is softer than cement mortar, allowing brickwork a certain degree of flexibility to adapt to shifting ground or other changing conditions. Cement mortar is harder and allows little flexibility. The contrast can cause brickwork to crack where the two mortars are present in a single wall. The setting speed can be increased by using impure limestone in the kiln, to form a hydraulic lime that will set on contact with water. Such a lime must be stored as a dry powder. Alternatively, a pozzolanic material such as calcined clay or brick dust may be added to the mortar mix. Addition of a pozzolanic material will make the mortar set reasonably quickly by reaction with the water. Polymer cement mortars (PCM) are the materials which are made by partially replacing the cement hydrate binders of conventional cement mortar with polymers. The polymeric admixtures include latexes or emulsions, redispersible polymer powders, water-soluble polymers, liquid resins and monomers. It has low permeability, and it reduces the incidence of drying shrinkage cracking, mainly designed for repairing concrete structures. For an example see MagneLine. Mortar mixed inside a 5-gallon bucket using clean water and mortar from a bag. 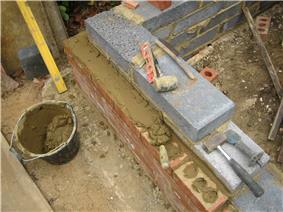 When it's the right consistency as in the photo (trowel stands up) it's ready to apply. As a general rule, however, Portland cement should not be used for the repair or repointing of older buildings built in lime mortar, which require the flexibility, softness and breathability of lime if they are to function correctly. It was invented in 1794 by Joseph Aspdin and patented on 18 December 1824, largely as a result of efforts to develop stronger mortars. It was made popular during the late nineteenth century, and had by 1930 became more popular than lime mortar as construction material. The advantages of Portland cement is that it sets hard and quickly, allowing a faster pace of construction. Furthermore, fewer skilled workers are required in building a structure with Portland cement. Ordinary Portland cement mortar, commonly known as OPC mortar or just cement mortar, is created by mixing powdered Ordinary Portland Cement, aggregate and water. It is not understood how the art of making hydraulic mortar and cement, which was perfected and in such widespread use by both the Greeks and Romans, was then lost for almost two millennia. During the Middle Ages when the Gothic cathedrals were being built, the only active ingredient in the mortar was lime. Since cured lime mortar can be degraded by contact with water, many structures suffered from wind blown rain over the centuries.